In James L. McLain's Osaka: The Merchants' Capital of Early Modern Japan there are numerous references to Karigane Bunshichi. The first is "1701 (Genroku 14) Members of Karigane Bunshichi's gang are involved in a stabbing incident — Sixth Month, sixth day..." The second is in a chronology on page xxiv: "The puppet play Karigane Bunshichi aki no shimo (Karigane Bunshichi: Dew of Autumn) debuts at the Okamoto Theater — Ninth Month, ninth day..." of 1702. 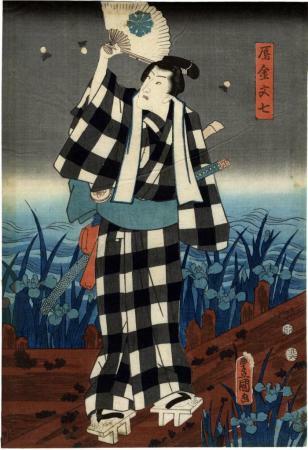 The next reference comes on page xxvi: "1776 (An'ei5) The character of Karigane Bunshichi is given a second persona as Soga no Gorō in the kabuki play Maki kaesu mikari Soga, which opens at the Morita Theater in Edo..."
Later on pages 125-126: "At the end of the seventeenth century and the beginning of the eighteenth, Karigane Bunshichi, Gokuin no Sen'emon, An no Heibei, Hote no Ichiemon, and Kaminari Shokurō haunted the streets of Osaka, robbing, beating, and even killing fellow residents. In the summer of 1701 the police caught up with the violent young men, and, after an investigation, authorities publicly executed them in the Eighth Month of the following year. The brazen personality of the ruffians and their contemptuous disregard for the law riveted the attention of Osakans, who began to create an intriguing set of myths about the motives and deeds of those ne'er-do-wells of Naniwa, a traditional name for Osaka. In time the condemned men were elevated to legendary status. Celebrated in ballads, plays, stories, and wood-block prints, the Five Men of Naniwa, thugs and murderers in real life, became transformed into protectors of ordinary people and the embodiment of the best and most noble aspirations and values espoused by the commoners of Osaka. The incident involving the Five Men of Naniwa unfolded at the same time that the affair of the Forty-Seven Righteous Warriors of Akō was capturing the imagination of the residents of Edo. That event began in the spring of 1701..."